Its winding down, but we still need to cross the finish line. We are almost there. No More political ads. No more mailers. Just in time for the holiday rush! Looking for people to hand out info at the polls! We can't rest yet! We have all kinds of Candidate and proposal info to pass out at the polls. Please let Ross Ensign know if you are available to assist, or would like more info. We need YOU! We can make this Red Wave go to Tsunami level, but only if everyone helps! When the polls close, where will you be to see the RED Wave coming? 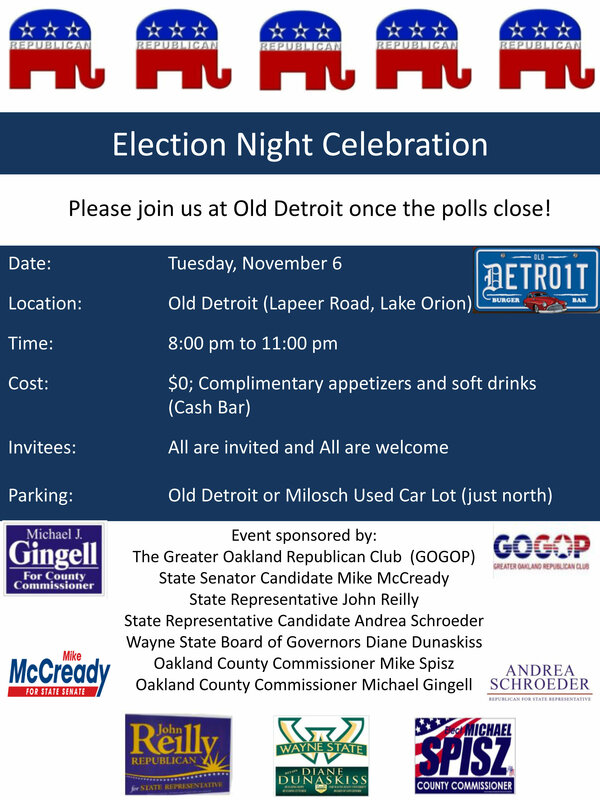 Why not join us at the Old Detroit Bar and Grill on Lapeer right after the polls close on Tuesday, Nov 6! Join GOGOP, Mike Gingell and Mike Spisz, Mike McCready, John Reilly, Andrea Schroeder, and Diane Dunaskiss as we watch the RED WAVE roll in! on (M-24) 741 S. Lapeer Road, Lake Orion hosted by Mike Gingell, Mike Spisz, Mike McCready, John Reilly, Andrea Schroeder, Diane Dunaskiss and of course, GOGOP! See you there! Wednesday, Nov 7: Leadership meeting at Al Hassinger's house, 7 pm. Note the day change due to Election! Tuesday, Nov 13: At the GOGOP General meeting at Canterbury Village 7:00. He's back by popular demand! Professor David Dulio from Oakland University to go over the election data and statistics as only Professor Dulio can! ***Don't forget, the Christmas Party is coming up and we are asking for you to once again bring an unwrapped toy to help the Lion's Club fill the baskets so there's A Christmas For Everyone. The party is on December 11 at the Knights of Columbus Hall in Orion. Remember this when you are Christmas shopping if you can.